Super flavorful Asian-inspired citrus soy glazed salmon combining healthy protein and omega-3 fatty acids with a crunchy and refreshing cucumber apple salad. This post is sponsored by Nakano Natural and Seasoned Rice Vinegar. Are you looking for an easy way to get a nutrient-packed meal that is bursting with flavor? One way I do this is pairing fresh seafood and vegetables with bold Asian-inspired ingredients. Whenever I’m in a pinch for time soy glazed salmon is an excellent choice for quick preparation. It’s also packed with beneficial nutrients like protein and omega-3 fatty acids that are good for brain and heart health. 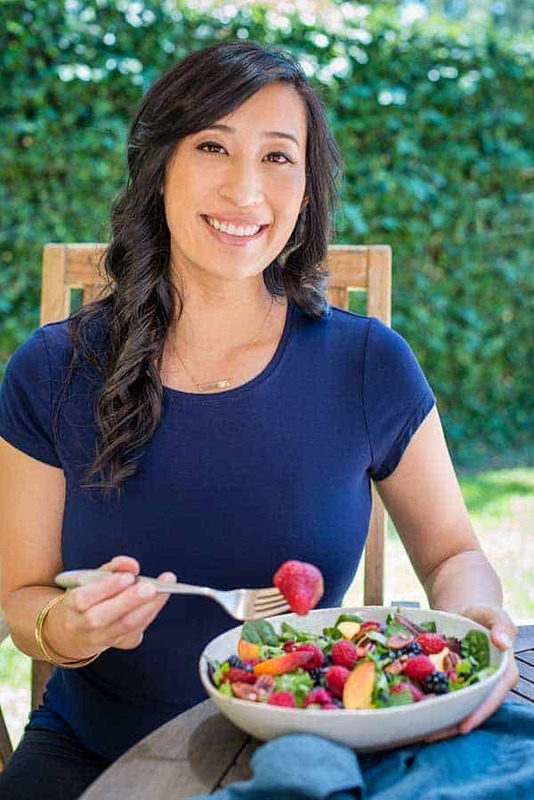 I love to incorporate as much colorful fruits and vegetables into each recipe. A crisp and refreshing cucumber and apple salad compliment the texture of this flaky fish. I can’t wait to share my secret go-to ingredient that instantly boosts the flavors of the sauce and dressing for the dish. A simple gourmet meal created right in your kitchen! When creating sauces and dressing with an Asian twist, a combination of savory, sweet and pungent flavors helps to increase the taste profile. For this citrus soy glazed salmon recipe the orange juice, soy sauce, seasoned rice vinegar, and ginger are concentrated down to a sticky texture. Removing the moisture allows all of the flavors to infuse together and become more intense. The salad is a vibrant combination of cucumber, carrots, bell pepper, and Fuji apples. The earthy and sweet ingredients are perfect for tossing in an orange dressing. A little bit of fresh ginger and honey are whisked in as well, but what makes the dressing pop is Nakano Seasoned Rice Vinegar. This pungent and tart vinegar adds a little bit of magic that I always use to brighten and boost the flavor of any dish. It provides a nice tangy balance to the spicy and sweet ingredients. One of the simplest techniques to cook salmon is high heat roasting. The extreme temperature cooks the salmon fillets within minutes. You can visually gauge if the fish is cooked to the perfect flaky texture. Just before serving a delicious citrus soy glaze is generously drizzled over the fillet, wow! To ensure maximum flavor delivery, the salad is marinated in some of the orange dressing. Right before serving make sure to drizzle some extra on top! This gorgeous citrus soy glazed salmon and cucumber apple salad can be served with rice for a complete meal. This citrus soy glazed salmon recipe is made to impress! Using simple techniques like roasting, reduction, and emulsification allows you to create a crafted culinary meal with ease. The sweet orange flavors in the glaze and dressing make each forkful of the salmon and salad pop! I always use a combination of time, temperature, and appearance to check for doneness. Typically for every one pound of fish, 10 minutes of cooking time is needed. This is an estimate, which can change depending on the thickness of the fish. I’ve also found that smaller portions like in this recipe will cook quicker than a whole fillet. For medium doneness, target and internal temperature between 135 to 140°F with a thermometer . You can also visually check by using a fork to try to separate the center of the flesh, if it flakes with little resistance and opaque in color, it’s ready! With a little practice, you’ll get a good feel for cook time and appearance. A quick and flavorful Asian-inspired soy glazed salmon recipe combining healthy protein and omega-3 fatty acids. Served with a crunchy and refreshing cucumber and vegetable salad. Combine rice vinegar, orange juice, soy sauce and ginger slice in a small saucepan. Reduce over medium heat until a thick glaze similar to a maple syrup is formed about 15 minutes, about 1/3 of a cup of glaze. Make sure to regularly check as the reduction will happen quickly. Turn off heat and whisk in butter until melted and sauce is thickened. Set aside. Add the sliced cucumber, bell pepper, carrots and apples in a medium sized bowl. Combine and set aside. For the salad dressing whisk together rice vinegar, orange juice, honey, minced ginger, olive oil and sesame oil until combined. Taste and season with salt and pepper as needed. Add half of the dressing into the cucumber salad mixture, toss to combine and allow to marinate. Reserve the other half of the dressing. Set salad aside or refrigerate if not eating within half an hour. Preheat oven to 400°F. Cover a sheet pan with foil and lightly grease with oil. Add salmon portions to the pan. Generously season with salt and pepper. Bake for 10 to 12 minutes, until salmon is tender and flaky. Drizzle some sauce on top of each fillet. Garnish with sesame seeds. Serve citrus glazed salmon with cucumber salad on the side, and rice if desired. Drizzle some additional dressing on top of the salad. How will you use flavor-boosting ingredients like rice vinegar to make your meals delicious? I always keep Nakano Natural and Seasoned Rice Vinegar in my kitchen to make favorite family recipes like Sweet and Sour Chicken. I’d love to hear about how you use it in your cooking! Hi Jill, thanks for visiting the website! Feel free to contact me with any questions. I can’t wait to hear how the recipe turns out for you! 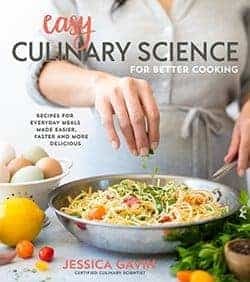 Hi Jessica – I am going to try this recipe out it looks so delicious. I will let you know what I thought of the dish but I am sure it is fantastic. Hi Terri! If you have any questions about the recipe or technique, please let me know, I would love to help! Happy cooking! Garlic infused in the cooking oil, yes! So glad you tried the recipe and enjoyed the dish Andrew!